What Weyland-Yutani Know About The Black Goo! Or, all they will admit to knowing about the Black Goo! Our member Necronom 4 was asking what W-Y knew about the black goo. So, it seemed sensible to post some information from the W-Y Report as separate topics, rather than having everything buried in my updates thread. I will be posting further snippets there as well, so feel free to check those out as they happen! As one would expect, certain information has been redacted, and other data completely omitted from the report, as it would require a much higher security clearance than S2! Of course the reasons for this are two-fold. 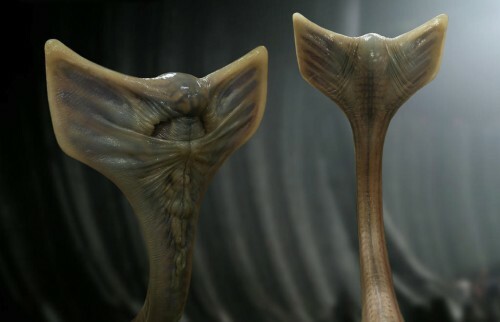 Firstly, that is in keeping with what we have come to expect from the fictional Weyland-Yutani Company, and secondly, there is bound to be a limit to what we can learn from the report, given that it could impact upon future movies in the series. Sadly there is nothing groundbreaking here, but it does give an insight into the Company’s thinking. W-Y feel that Shaw and Holloway’s assumption that the Engineers invited us to come and find them could be presumptuous, especially given the nature of their cargo. They feel the pictographs highlighted are more likely to be a warning to stay away. They say that a case could easily be made for the Engineers being our brothers rather than our makers. Everything below in bold italic is quoted directly from ALIEN The Weyland-Yutani Report by S.D. Perry. Circumstantial evidence indicated that the Engineers were related to humans- the DNA typing was conclusive, but the assumption that they created us may be fallacious. At this time the company is not prepared to go on record with the data currently collated regarding the Engineers and their role in the creation of humanity. From the observations of David 8 and REDACTED we know that the Accelerant is self-activating and that it manipulates the genetic structure of the living beings with which it comes into contact. The Accelerant had no apparent effect on David 8, presumably because the android lacked a genetic code. That the Engineers’ cargo was specifically a manufactured biological genetic accelerant cannot be proved or disproved, but the Engineers’ hold was clearly full of something toxic to mammalian life, to human life. The creature discovered by Millburn and Fifield may well have been an accelerated version of any number of natural, symbiotic microbiomes carried by humans- bacterial, fungal, archaeal. Alternately the “hammerpede” was created when Accelerant came into contact with indigenous life-forms in the soil. The Accelerant/human hybrid implanted in Shaw’s uterus resembled a Cephalopod. The Shaw-birthed creature implanted something into the Engineer, then appeared to die. Captures from the wreckage on LV-223 clearly show a related organism emerging from the chest of the Engineer sometime later. Was the Juggernaut bound for Earth? AP David believed so but its interpretation may have been flawed. Based on the AP’s belief Shaw decided that the Engineers meant to destroy humanity, although she was unable to theorize a motive. COMPANY NOTE- Redacted information regarding the sentient life-form known as the Engineers and additional material gathered after Doctor Elizabeth Shaw’s last officially recorded transmission is restricted to an S1 clearance. Information collected from uploads of USCSS Prometheus’s mainframe to net. The Company’s interest in the Engineers and the Accelerant is ongoing. The mysterious black, viscous liquid promises answers to questions we’ve not yet begun to ask regarding the technical creation of life. 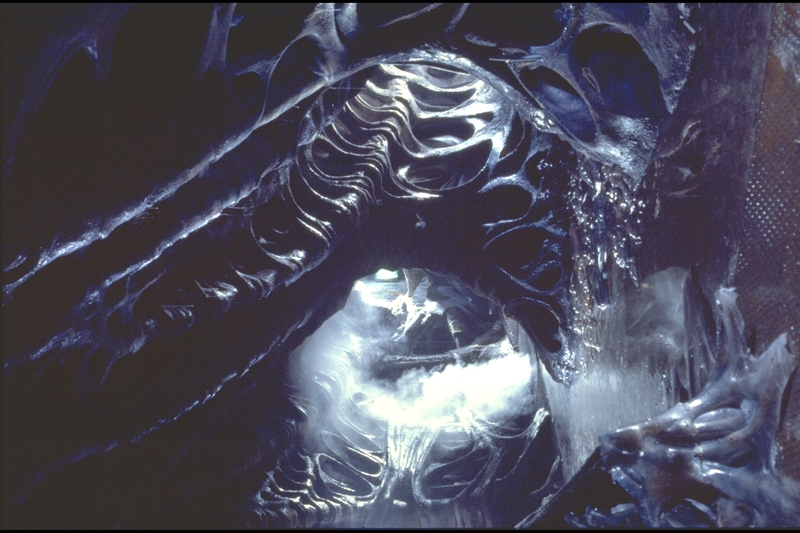 170 Responses to What Weyland-Yutani Know About The Black Goo! Thank you for this most interesting share it bares on the importance of the 10 years which allows Weyland Yutani to enter into the story telling with their own very strong theme and how much they know when Covenant leaves earth.. This bares out my supposition I offered in the thread concerning Robotics within the hierarchy of Weyland Yutani. They are aware of the events of LV223 and indeed they may have David's memory bank (unknown to David) linked to the main frame. The covert reason for the mission to Paradise maybe to recover David and his new found secrets in relation to the Accelerant. I would also argue that my reading of W Y view of the accelerant, which is the same as my hypothesis, then separates out the indigested material shown in the sacrificial scene by the creator gardner Engineer. That is a benign catalyser which creates and evokes new life on a planet by breaking down and re organising raw matter and introduces the civilising Engineer strain leading to for instance mankind quite separate from the Black Goo which re organises and generates the overstimulated (Hammerpede, Fifield, Holloway) and in the right combination the Deacon. Now, who could David have been collating information with. This suggests someone else was observing his analysis of the Goo! To me it suggests either another android amongst the crew members, that we don't know about? Or, David was in contact with/being observed by Weyland-Yutani Scientists/Synthetics back home. 'COMPANY NOTE Redacted information regarding the sentient life-form known as the Engineers and additional material gathered after Doctor Elizabeth Shaw’s last officially recorded transmission is restricted to an S1 clearance. Information collected from uploads of USCSS Prometheus’s mainframe to net". @ Lone would this paragraph not reinforce the notion that after Shaws transmission that data was still flowing back to the company either knowingly or unknowingly from David. David's relationship with WT may be conspiratorial or clandestine but if he is in communication with other robotics in the company he may have received a directive to "save" Shaw. The first intent may have been to fly a juggernaut to earth with the Black Goo, that was David's first suggestion to Shaw but David may have concluded that he would enter into a "Covenant" with Shaw to fly to Paradise knowing that his "redacted" companion would be able to monitor their journey. The redacted companion maybe David 9. Indeed David 9 and 8 maybe working outside of W Y remit or the non robotic part of the hierarchy. I think you are absolutely spot on about the main aim of the Covenant mission being to find David and as per usual the unsuspecting humans will be pawns and fodder for David's experiments! ...and the difference between the pure gardner Engineer accelerant and the black goo accelerant is that it contains MORB DNA. .....pure gold Michelle, and David 9 will be on board the Covenant! You have given us the main plot line! There could've been a Yutani starship in orbit around LV233, arriving just after the Prometheus...A spy ship, in full communication with David 8? Unable to match the speed of the Juggernaut as it heads for Paradise........Yutani has to regroup and send a mission to recover David 8. Yutani are explorers? Unconcerned with black goo or dead aliens? Maybe they are looking for the real deal....Gods. Weyland: Find alien artifacts, sell to military for big bucks. Yutani: Find living aliens and their Gods. I don't know if Yutani was hanging around there just yet... I am beginning to believe that, yes, Yutani knew about the mission and one of the events leading up to/causing merging with Weyland, but I don't know if Yutani was really hanging around and in contact with David especially. This is awesome, thank you for posting and forgive me as I ramble. I so enjoyed this and so wanted to reply that I've stopped everything and poured a glass of Shiraz. That scene of David's finger is another of my favorites, it's a message unto itself, a heightening of attention. In Gavin's thread exploring the parallels between ID4 and War of the Worlds, I complained about an excess of symmetrical framing, but honestly it was more just that scene of the White House being destroyed, and the artificiality of it, which was exacerbated by the composition. 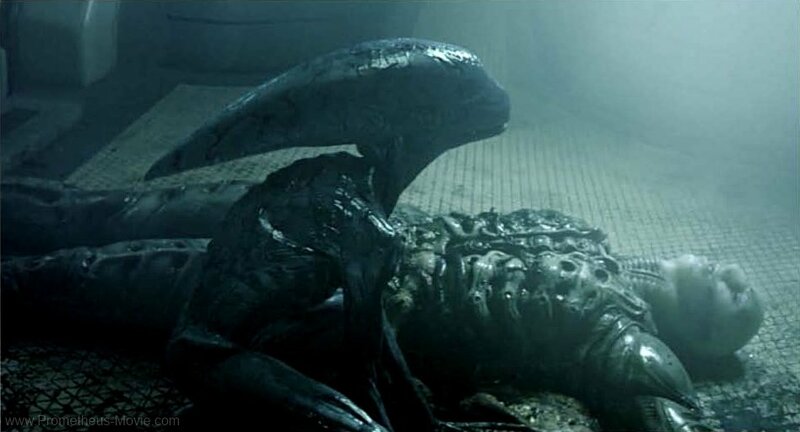 There's plenty of symmetry in Prometheus, but it reads more as a Kubrickian homage than laziness (my interpretation). Another significant parallel is the star maps, this time being between Prometheus (heretofore known as P) and Alien (heretofore known as A). Like so much of P, there was little exposition, in this case about the maps. The story gave us the truth about them, that they were, like the beacon on LV426, a warning that we blindly responded to. No one came right out and said it, it was just there. When you think about it, even the music quite cleverly clued us in, this sort of haunted optimism overlaid with celestial doom. I think several story beats from A were woven in, to sort of intellectually get us on board. The information you've posted is really interesting, especially the redacted parts. I wondered about what the Liquid would do if exposed to bacterial life. I imagined that the Engineer (or Space Jockey) homeworld might, out of necessity, be sterilized due to exposure to the Liquid. A dead world, until an asteroid bearing bacterial or viral life struck an ocean tainted with MORB juice. What happens then? What new nightmares are spawned? I know many are unimpressed by the ideas in P, but to me, the possibilities are infinite now. It's possible peeps will see it differently soon. The Liquid is genius, it's MORB juice! An interstellar buffet of biological nightmares. Poor humans. I've always felt Prometheus was the lighting of a fuse. Oh, I hope I hope I hope. The 'redacted' may not be touched upon in the new film. WYR was written back in 2013, prior to a sequel script being completed, and long before it became Alien: Covenant. I like how it was used here and there to indicate there's more things going on that are above your security level. I kinda figured Yutani followed the Prometheus and observed it's fate from orbit. I also imagined Yutani could have their own Synthetic secretly tasked with finding, debriefing and finally destroying David, along with collecting 'samples'. I also imagined Vickers actually survived, because the Juggernaut was still somewhat functional and actually near weightless when it rolled onto her. I imagined a lot of things. Just the way it rose into the sky. And then slowly fell to ground. I felt it had made itself weightless, to clear the planet it had departed, and was still somewhat weightless when it landed on our doomed astronauts. I imagined a Yutani Synthetic would reactivate it and it would abruptly sink several meters into the ground. What about the big impacts when it the ground? Or cracking Shaw's mask? Thanks to everyone for the replies, they make excellent reading! @Aorta Glad you enjoyed this and what an awesome reply! The more time passes the more I appreciate PROMETHEUS. It even lends more depth to ALIEN, not that Alien needs it, but as you say, it certainly compliments the hints that are there! Yes, it has been discussed in the past Something Real! Isn't it just an amazing image and idea? David uses his imprinted finger to start up the ships computer and systems after the Prometheus reaches destination threshold. A search should take you to any of the previous discussions on that topic! It's all good the discussion goes on and on. Yes that is a Weyland logo imprinted on David's finger. In their eyes, he's a product. Good point. Let's say maybe not weightless, but not nearly as heavy as one would imagine. The thing was crippled when it came down, but maybe not dead yet. I mean, come on. It should have pulverized Shaw. I'm just thinking maybe Ridley and co. left a lot of story lines open. That there's as much to be read into what didn't happen as to what did. You can't put it past these people, that's part of the fun. Edit: The Juggernaut striking the ground was this weird, gigantic 'Alice in Wonderland' moment, an epic tumor falling from the sky. It should have thrown our astronauts off their feet, but it just rolled on top of them. It had to weigh a LOT, but even when it came down around Shaw there was little disturbance. I highly doubt all the incredibly talented minds behind the movie failed to register this. I think it was a message unto itself, an open storyline at the least. Yutani ? Wayland venture.....P R O B E S ! Like This? Question is who is probing who? Exploration of space by future space corporations would be extensive, Robots would be the first to find any Alien habitation on other worlds. These robots would be sent deep into space leaving satellites behind them to help transmission of information. They would also be faced with an ever expanding space between home and the Monitoring of that expanse. They knew of the signal from LV 426 decades before they sent Prometheus. Why not send it to LV 426 first? Well they sent probes first to LV 426. Something happened there! I speculate that the signal from the derelict was directed at LV 423. Prometheus was the first to arrive here? If the military finds out about that GOD! there is going to be some kind of reaction! What I find odd about the Engineers is they all look the same...they are Humanoid but not totally human. Were they engineered first? We know they have Human DNA but what about the rest? Somehow I think the goo has something to do with that but who really made it? I also think there could be a connection to the Green crystals and the green goo...one which might mean that the god can affect more than just organic material and DNA. How did they make those structures? and the gradual difference between the Juggernaut and the tunnels connecting to the Temple. The canisters are also subject to transformation? When it came down around Shaw, she was right under the end of hammerhead prong, it was at the end of its fall and hit a rock, which is ultimately what saved her. If she'd been further under the prong more towards the base she would've been crushed like Vickers. @Lone; thank you so much for sharing this info with us. I asked the question because of that image of Davids finger holding the goo with the, what looks like, infected DNA, really got my attention. I will probably purchase the book eventually, but unfortunately at the moment I'm skint. If we do take this book as canon, then we have been given even more questions to think about. "the Engineers’ hold was clearly full of something toxic to mammalian life, to human life." As the Goo/Accelerant been tainted by something toxic? Was it not intended to evolve us but intended to evolve some other organism? And this part is really interesting; "They say that a case could easily be made for the Engineers being our brothers rather than our makers." Assuming that the Company are correct in their summation, what could this mean? Is it possible that the engineers are in fact the Nephalim? Maybe the Elders went to the daughters of man and had children with them and those children were known at the time as the Nephalim. Then thousands of years later, Shaw would address them by another name The Engineers? Or, could it mean that the engineers were created by the Elders (or some other beings) on a planet somewhere else in the cosmos, in the same way we were created? @S.M Welcome to the forum! Given the Juggernaut's massive size one would assume it would weigh an incredible amount. Yet when it hit the ground it barely made an impression. It really should have crushed that rock and Shaw, and sunk into the ground a little. Debris from the Prometheus came showering down all over the place, and yet the Juggernaut appeared to sustain no major damage! Aorta makes a very valuable point. We can barely fathom the tech behind these ships, they don't behave in a manner that we would interpret as normal. The goo in the Engineers possession is tainted. As AORTA said it's MORB juice! Making it differ from the pure bioform Accelerant we see the Sacrificial Engineer drink. I think that the Company believe that, just like humans, the Engineers were created too, possibly by the same maker. Thus making them our brothers. Though to me, the apparent lack of females would suggest that their creation was as gardener/servants. Given the circumstances presented I don't see why it should've crushed the rock at all.The fact it doesn't crush the rock is supported by the fact it seems to make little to no impression in the ground, and vice versa. I'm not insisting it was weightless, just having some fun with the idea. I like to play with little side stories that elevate the weirdness of the already quite weird Prometheus. I could see Vickers surviving...maybe a broken leg or broken back...pinned between a spar(the ship has plenty of bumps and spaces to keep her from being completely crushed)...then the Deacon finishing her off....Or the Deacon saving her for the Queen? Vickers spits at the Deacon, attempts to punch it...trying to incite the monster to put her out of her misery. But the Deacon needs her for a future facehug and to start a family of MORBS. Who knows what the Deacon has been up to in the ten years that have elapsed between Prometheus and Covenant! First we have to remember we have no dates, unless Lone can give us any on the information released as this book contains information Gathered from late 21st Century to late 24th. So the information on the Prometheus Mission we are not 100% when Weyland got his, and if its after the Merger.... but i would ASSUME the book is Canon as far as the series and that Fox collaborated with the Authors. But it would be logical to assume that David kept logs with everything he was doing, or the company recover David at some point or he informs them at some point, what i am saying is the information could have been gathered in 2093 well sent out, or it could have been gathered on a mission to LV-223 or indeed after that. Perhaps between Alien Covenant 2104 ish and Aliens 2179 maybe there is nothing to salvage from the Engineers apart from the Derelict on LV-426? I feel this book is mainly a attempt to explain certain things, but its done in a way that is led to us thinking its official information that Weyland-Yutani have recovered, which would mean information could have been picked up from sensors or sent back to Earth. Maybe a back up of information is stored on the Escape Module the Lifeboat? That would make sense, and it would appear the Lifeboat CCTV captured something... which would then surely mean the Company would 100% go back to LV-223. We have to wonder where Yutani come in all of this, and this book does seems to show us the Merger had occurred 5+ years after Prometheus. I will turn our attention to the Weyland Industries Website, unless Lone can share what the book says? The Weyland Viral site and videos show that Yutani are in part a communications and IC (integrated circuit) company and that Weyland ships use Yutani ECU and other communications and that also Yutani could have accessed messages sent between Shaw and Weyland as they (Yutani) could have and most likely have been monitoring such exchanges, and also Yutani could also have programed their ECU and Communications to send back information to Yutani i.e Spyware. There has to be a reason for Yutani getting into trouble, and i would ASSUME as covered in another topic the other day.... that maybe Yutani a company who has lost Billions to Weyland due to Weyland having a better Monopoly over the Android market. So Yutani find out about the failed Prometheus mission and maybe they know more than Weyland HQ and so they then send their own Costly mission to LV-223 and after this, the company are broke and a Merger is Forced... what would Weyland gain? the mountains of knowledge maybe Yutani uncovered.